Bobby Jones said “The best exercise for golfers is golfing” and I know what he means. In general it’s a pastime which involves getting out in the fresh air, walking for several hours and loosening up with some aerobic “swinging”…gotta be good for you right? Unless you are doing it for a living or it’s your dedicated sport, you probably took it up as the exercise for your twilight years, whenever they may have started. The snag is, because you might be playing in later life, you are more susceptible to the risk of stresses and strains that golf can present and you’re probably unprepared for them. The reason I am writing about golf injuries is because it is now 6 months since I played a round due to a knee injury, made worse by playing golf and ignoring the problem. The eventual outcome was surgery, and now, with perhaps another 4-6 months before I play again, I thought I’d share my thoughts on the matter and perhaps prompt some readers to consider any nagging pains and what they might do about them. Better still, some may be in the peak of health and rather than take their chances on what might be on the horizon, head any issues off at the pass. First, a disclaimer…I am not a physician (sports or otherwise) of any kind, just someone who has had a lot of time to deal with a golf injury, researched the issue for many hours, and endeavoured to fix myself so that I can return to the links better and stronger as a golfer. I’m also not going to talk about general fitness, health and well-being (diet, exercise etc) because all of us are bombarded daily by the common sense of leading a healthier life; it’s something we either adopt willingly or not. 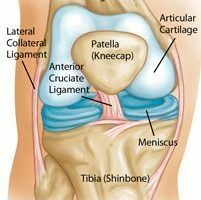 I’ll focus on my own particular experience; meniscus tears, cartilage degradation and general deterioration of the left knee…it’s worn out! If you look at the attached picture of the knee’s anatomy, it’s quite a simple but ingenious structure. In Layman’s terms, the knee connects the lower leg bones to the upper and allows the leg to hinge. A joint, it is stabilised by ligaments (strong “elastic bands” either side), cushioned by cartilage (in this case a disc-like pad called the meniscus) plus a layer of cartilage on the end of the bones, and protected by the Patella (knee cap) a triangular bone at the front. Completing this clever piece of kit are the leg muscles and hamstrings that provide strength and support. Now remember I described it as a hinge, I did not say it is designed to swivel, hence its incompatibility with the game of golf. Awesome for walking and running, the knee is badly designed for the rotation of a golf swing; remember your left foot is at right angles to the target at address, and more or less pointing at the target on completion of the swing…what stress was applied during the transition? In essence, when playing golf you are grinding the knee’s insides together applying both longitudinal and worse still, significant lateral forces on those “elastic bands” and cushions. Now lots of golfers play all their lives and appear to survive the rigours of the golf swing. However, factor in a contact sport when young (mine was rugby), or a simple twist or dislocation from time to time, plus add general wear and tear over 50 years and the trap is set. So what do we do about it? Golf is a great sport for later life but it takes some maintenance to keep your body pain free over time. Stretching may be better than practice for enjoying a pain free game. 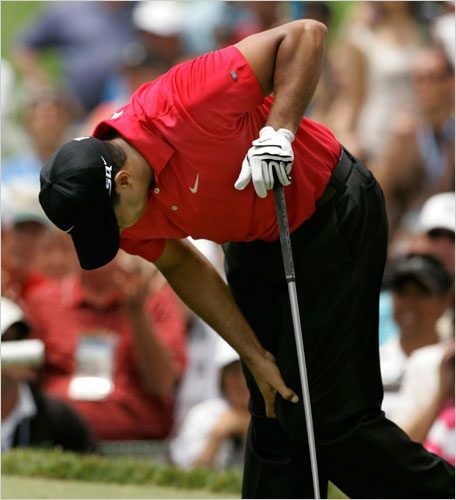 Most players need to make some time to stretch before playing or even spending time on the range. No-one’s body wants to be torqued and twisted without a little warning. While many players arrive right before tee time to play, a fifteen minute stretching routine can make a big difference. Note, you can’t stretch enough! First, warm muscles, sinews and ligaments are more elastic allowing better stretching, therefore walk to the range to get your heart rate up a little for a warm up. Perhaps work from head to toe so you remember to stretch the whole body. Hold each stretch for 20 seconds. Don’t bounce or stretch to the point of pain. 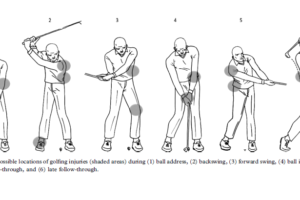 There are literally dozens of stretching regimes (golf-specific) on websites such as YouTube so I won’t go into particulars here. What about after the round? The clubhouse is a great place to relax and retell the stories of your round but after you’re done, a hot shower and a few more stretches should prevent the next day stiffness and keep you ready to play again. Of course in Thailand you have cheap and effective massages on your doorstep after every round! Finally, if the signs of problems are already there don’t ignore them, whether back, knees or shoulders. Do not play through any pain! Educate yourself about measures you can take to heal yourself (the Web has significant self-help information), or seek medical advice and discuss with someone who has/is experiencing the same thing. Don’t allow a nagging pain to grow into something that deprives you of a game you love for a whole year…learn from other’s mistakes.